Rangers: How will SPL chairmen vote? Scottish Premier League chairmen are to meet on 4 July to vote on a new company Rangers' application to join the top flight. While "oldco" Rangers are now in the process of being liquidated, 'newco' Rangers hope to gain admitance. 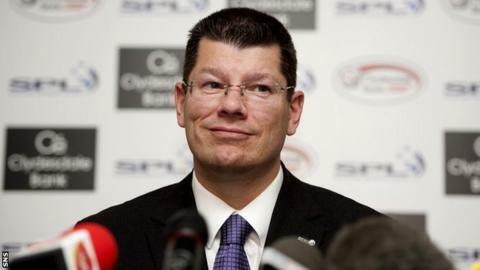 Some SPL chairmen are keeping counsel on their intentions but others have gone public, with five clubs opposed to the move. With the new Rangers needing an 8-4 majority vote in their favour, Charles Green's company would appear destined to start life in a league below the top flight. Aberdeen: The Pittodrie club plan to vote no. Pittodrie Chairman Stewart Milne said: "I can confirm it is our intention to oppose readmission to the SPL for any Rangers NewCo. "If readmission were to be refused, we believe the appropriate course of action would be for Rangers NewCo to apply for membership to the SFA and to submit an application for admission to the SFL. "One of our major objectives has to be to work with everyone concerned to ensure that the commercial challenges that this case has and will continue to cause can be mitigated as far as they possibly can so that sporting integrity can be the overriding factor. "Reorganisation of the game is a priority and is something we have been actively involved in for a long time, but it is not something that should be rushed through just to deal specifically with one club." Celtic: Celtic chairman Peter Lawwell issued a statement that: "Our guiding principle is that we will do what is in the best interests of Celtic Football Club and our supporters, consistent with upholding the interests and reputation of Scottish football. "We are fully aware of our supporters' concerns regarding the current situation across Scottish football." Many Celtic fans have also been vocal in calling for Celtic to vote against admitting a 'newco' Rangers. Dundee Utd: A definite no. Following a meeting between supporters and board members, a club spokesman said: "A form of sporting punishment must form part of the reasoning behind any decision made and, therefore, [the club] cannot vote the newco into the SPL. "The board of directors will act in the best interest of Dundee United and our supporters and Scottish football on this matter." United chairman Stephen Thompson earlier described the SPL vote on Rangers as a "a major crossroads for Scottish football." Club owner Vladimir Romanov said the "football mafia represented by Rangers' former owners" should not be allowed back in under any circumstances. "All of this brought hollow victories and destroyed football." Hibernian: Hibs became the third club to publicly annouced they would vote against a newco. Chairman Rod Petrie had previously commented strongly his view that financial issues were outweighed by considerations of integrity. "Following a meeting of its board of directors, Hibernian FC confirmed that the club will vote against the transfer of the Rangers share in the SPL to a newco," said a club statement. "This re-affirms the view of the board that the sporting integrity of the SPL is of paramount importance. "The board is also acutely aware that in making this decision, Hibernian - like other clubs in the SPL - will suffer collateral financial damage at a time of severe economic hardship and uncertainty. Inverness CT: Club number four to say they are rejecting newco Rangers' application to join the SPL. "The past few weeks have been extremely hectic in terms of our supporters and season ticket holders making their views known in great numbers to the club, as is their right," said chairman Kenny Cameron. "It is fair to say that in excess of 95% of them raised the issue of sporting integrity as the reason why they don't want the newco to be admitted and had not yet renewed their season tickets. "Financially, we examined the various scenarios and, frankly, none of them were positive for our club, it is extremely disappointing to be adversely affected by something not of our doing, unfortunately this is a similar situation for the rest of the clubs in SPL. "We have also been contacted by supporters of various other SPL clubs, saying they would not be back to Inverness if we did not accept that sporting integrity was what mattered, but this is something that we had already considered and it is not only the integrity of the SPL that is at stake but the integrity of Scottish football. "It is quite clear, that supporter opinion in Scotland overwhelming supports that view. Supporters are the life blood of any club and we would have been foolish not take on board their opinions on this matter, they are our customers and any business that ignores the views of it customers does so at its peril"
"A substantial amount of our own fans have withheld from buying their season tickets, saying they will not do so if we vote for a newco to re-enter directly in to the SPL. In now making clear how we will vote, we expect these fans to come forward fairly quickly and renew their season tickets and give Caley Thistle the financial injection it requires for the 2012-13 campaign. "We are hoping that all the ICT fans will now rally round and buy extra season tickets to cushion the blow of the potential loss in revenues from elsewhere." Kilmarnock: Chairman Michael Johnston is worried about the financial hit his club will take in a league without Rangers. He predicts the club will lose £300,000 in gate money from the opening day of the season if it is not Rangers visiting Rugby Park. He also has concerns about a loss of future TV revenue. Without a Rangers, Johnston says "the SPL will have breached its contract with Sky and other commercial partners who require Old Firm derbies as part of the SPL's contractual obligations". He adds: "Termination or renegotiation of these contracts may follow with unquantifiable (but certainly negative) financial consequences for all 12 member clubs." In address to shareholders and season ticket holders who have been invited to vote on the matter, he continues: "I firmly believe that the success and prosperity of our club will always come first with our supporters. "I also believe that our supporters appreciate the progress we've made over the last two seasons and are keen to be a part of what we hope will be an exciting period ahead. Thus the healthy season ticket sales to date - ahead of last year's figures." Johnston also points out: "Rangers Newco" has offered to accept a range of sporting and financial penalties for the wrongdoing of "Rangers Oldco", as well as undertaking to support a change to the SPL's iniquitous 90% (11-1) voting structure to a more democratic 75% (9-3), if allowed entry to the SPL. This is not insignificant and is recognised in the third option on the consultation response slip." Killie shareholders / season ticket holders can vote Yes, No or Yes with penalties (short of exclusion from SPL). Motherwell: The Fir Park club are to canvass fans' opinion on the topic before they cast their vote. Adult members of the 'Well Society and a small number of existing minority shareholders who have yet to join the group will be balloted on the issue. Motherwell say the result of the supporters' ballot will be "used to determine which way the club votes", although they warn of grave financial consequences. An earlier statement from the club read: "The 'newco' issue is often portrayed as a straight choice between preserving sporting integrity and clubs accepting a reduction in gate money together with potentially a significant amount of commercial revenue. In reality it is far more complex. "We are fully aware that an overwhelming majority of our fans and most others, who have so far expressed an opinion, are totally opposed to 'newco' being allowed immediately back into the SPL. "The common response to the potential loss of revenue is that clubs need to cut their cloth accordingly. Of course this could be achieved over a period of time, by reducing both on and off the field costs, but it cannot be done overnight." One of the more surprising facts to emerge from Rangers' impending liquidation is that they retain a share in the SPL when it comes to the vote on whether to allow a new form of the club a place in the top flight. Rangers' vote will be exercised by 'oldco' administrators Duff & Phelps. Charles Green has formed a new company after completing his purchase of the Ibrox club's assets for £5.5m. Green insists Scottish Premier League rivals should base their votes on finance, rather than passion. "There is no easy solution," said Green. "It's something we all have to deal with, we all have to take responsibility for. "And we all have to come up with something that works, not just for an individual club, but for the whole collective." Ross County: The SPL newcomers, promoted from the First Division in May, have not spoken publically on the subject. Some newspapers have speculated that chairman Roy McGregor could vote for Rangers to be admitted. However, in the absence of any official statement from the Dingwall club, it's impossible to predict which way they will vote. St Johnstone: Saints are expected to vote against a newco being admitted to the SPL. Saints chairman Steve Brown had previously said that he would like to see a 'newco' Rangers punished. At a private meeting with fans' representatives, Brown is said to have announced their decision on the grounds that St Johnstone's best interests, and those of season ticket holders, were of paramount importance. St Mirren: A statement issued by the Paisley club said: "The board of directors as well as all other St Mirren supporters totally understands the sense of injustice felt at this time instigated by the way in which another club in our League has conducted their affairs. "Once all the facts are available to the board of directors, they shall take any decisions that are required, in the best interests of St Mirren Football Club only as their guiding line. "The Scottish Football authorities and commercial partners, over which we have limited control, have many decisions to make prior to our board making any valued appraisal. "The board have a responsibility to make the correct decision for St Mirren Football Club and as directors of the company, they have done so over a long period of time, this policy shall continue during this difficult period for Scottish football." Buddies chairman Stewart Gilmour is currently engaged in trying to sell the club and director Kenny McGeoch was voted off the board in May following revelations he had a meeting in the St Mirren boardroom with lawyer Gary Withey, then of London-based firm Collyer Bristow and also Rangers' company secretary, over his plans for a takeover deal.